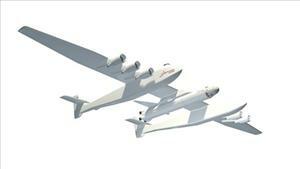 (Newser) – The world's biggest plane, with wings longer than a football field, is being built to launch astronauts and cargo into outer space. 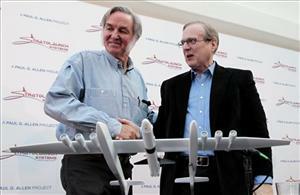 Microsoft co-founder Paul Allen and aerospace innovator Burt Rutan have teamed up to create the gargantuan aircraft, which will work by hauling a rocket high into the air and then blasting it into space, thus bypassing the need for a launch pad and saving on fuel, reports AP. They unveiled their plans yesterday. The project comes at a time when NASA has discontinued its shuttle program and engineering firms are vying to fill the gap in space flight technology. Allen says the special plane—which boasts twin fuselages, a 380-foot wingspan, and six 747 engines—will "keep America at the forefront of space exploration." The first unmanned tests should take place in 2016.